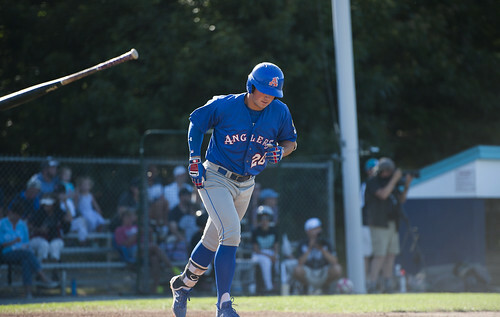 After dropping their second-straight game Tuesday night, the Chatham Anglers (18-17-2) will return to Veterans Field to face off with the Harwich Mariners (16-19-2) at 7 p.m.
Coming off consecutive fogged-out, five-inning games, the A’s will have another chance to clinch their spot in the playoffs with a win or tie and Brewster Whitecaps loss. Chatham currently sits five games back of the first-place Yarmouth-Dennis Red Sox and two games ahead of the Mariners. The Anglers offense has been dynamic for most of the season but has stumbled from time-to-time this summer. Chatham’s stats against its next two opponents — the Mariners and the Red Sox — highlight the best and worst of the Chatham offense. Despite playing one more game against Y-D than Harwich, the Anglers have registered the same amount of plate appearances (170) against both teams. The A’s are crushing balls against the Mariners this summer. Chatham is hitting .331 with a .425 on-base percentage, 14 extra-base hits, 20 walks, twelve stolen base attempts and 35 runs scored with only 33 strikeouts in the four games against Harwich. Against the Red Sox, the Anglers have not been able to string together hits. Chatham is hitting .211 with a .298 on-base percentage, .382 slugging percentage, 17 runs scored, 10 stolen base attempts and 44 strikeouts. 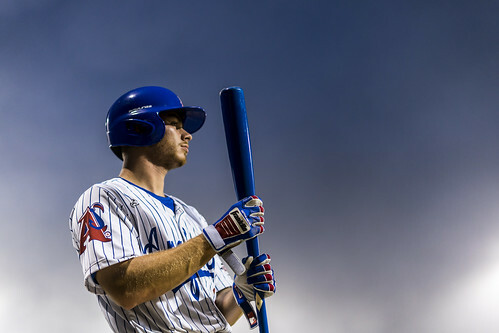 The Anglers’ success against Harwich epitomizes what the Chatham offense does when it is at its best — drawing walks, slugging the ball for extra-base hits and being aggressive on the basepaths. Against Y-D, they have struggled in all three categories. Heading into the playoffs, the A’s offense needs to look more like the offense that stings the Mariners than the offense that flounders against the Red Sox. In the Anglers’ last four games, the pitching staff has had its worst stretch of the season. A’s hurlers have allowed 36 runs in their past 27 innings, including 24 runs in the past two games, both of which were fog-shortened, five-inning contests. Chatham’s starting pitchers have struggled from the get-go. In four of the team’s last six games, the starter has allowed four runs or more. "Walks are a big part of it. Locations, too,” Colin Simpson (Oklahoma State), who has started at catcher in three of the last six games, said. “It's pretty hard to get guys out when you’re leaving balls down the middle." Much of the Anglers’ struggles on the mound have come from lack of command. Chatham has walked the third-most batters (145) and hit the second-most (35) in the league. In their last three losses games, A’s pitchers combined to walk 17 batters while throwing 276 strikes compared to 174 balls. For the fourth time this summer at Veterans Field, the Anglers had a game cut short due to fog Tuesday night. Only one game was fogged-out at Veterans Field in 2017. A’s manager Tom Holliday has been annoyed with the fog each time it has come to Chatham’s home field this season. When it came during a 3-3 tie against Hyannis on June 21, Holliday said it disrupted a probable A’s win. After Spencer Torkelson (Arizona State) and John Rave (Illinois State) each misjudged fly balls in the fog against Brewster on July 17, Holliday said it is impossible to prepare for it. “I’m so sick of it it’s not even funny,” Holliday said on Monday. Spencer Torkelson (Arizona State) left for Team USA on a hot streak and returned still swinging a hot bat. The rising sophomore is 10-for-23 with a home run since returning to the Cape on July 16. Torkelson left the Cape on a 10-game hitting streak and extended the streak to 15 games before having it snapped on July 23. The 15-game streak is the third-longest in the league this season. Spencer Torkelson has raised his batting average from .389 to .407 since returning from Team USA. There are only two games in which the Arizona State product has not collected a hit — June 13 against Yarmouth-Dennis and July 23 against Cotuit. On June 13, Torkelson finished 0-for-2 with two walks. On June 23 — which was called after five innings due to the fog — he finished 0-for-2 with a walk. Torkelson has reached base in every game he has played in for Chatham this summer. That streak of 19 consecutive games is the longest active streak on the Cape, one game ahead of Logan Wyatt (Louisville) of the Orleans Firebirds. Torkelson needs to reach base in three more games to tie the season-high of 22 games achieved by three players — Matthew Barefoot (Campbell) and Davis Wendzel (Baylor) of the Hyannis Harbor Hawks and Tanner Morris (Virginia) of the Harwich Mariners. The Anglers activated three news players Tuesday — Joseph Lowder (Appalachian State), Reeves Martin (New Orleans) and Dan Valerio (Southeastern). Lowder comes from the Lenoir Oilers of the Southern Collegiate Baseball League. The right-hander was an All-Star in the league this summer. The reliever threw 13 innings in 11 games for the Oilers, striking out 28 batters. Martin is a right-handed relief pitcher who has been a workhorse at New Orleans for the past two seasons. He pitched in 31 games his freshman campaign and 29 games this past season. Martin can go multiple innings out of the bullpen and has averaged just under two innings pitched a game in his NCAA career. For a team that has run into some bullpen issues over the past few weeks, having Lowder and Martin in the pen is a major bonus. Dan Valerio made his debut for Chatham on Tuesday, starting at second base and batting ninth. Valerio is a utility player who raked at NAIA Southeastern this spring. The rising senior hit .390 with 17 homers, 27 doubles, 29 stolen bases and a team-record 84 RBIs. He was named a NAIA second-team All-American as Southeastern won the NAIA World Series. Valerio said he got a call from Holliday on Monday at work and was in Chatham by 10 p.m. that night. Valerio started Tuesday’s game at second base, finishing 0-for-1 at the plate. Three of the Whitecaps’ 11 wins this season have come at Veterans Field as the Anglers have failed to beat the East Division bottom-dwellers at home this season. The A’s have been outscored 27-8 in the three home contests, while winning all three games at Stony Brook Field by a combined score of 32-3. Three of the Anglers’ top five hitters — Torkelson, Blake Sabol (Southern California) and Tristin English (Georgia Tech) — hit better on the road than at home. Five of the other eight position players on the active roster with at least 10 at-bats have higher batting averages away from home as well. As a team, Chatham bats 13 points higher and has scored 22 more runs in away games. The A’s record at Veterans Field sits at 7-11-1. On the road, they are 11-6-1. Anglers pitchers also struggle more at home . Chatham’s staff has posted a 3.43 ERA in away games versus a 4.67 ERA at Veterans Field. It has walked 37 more batters (91) and allowed 46 more runs (115) at home than on the road. After facing off against the Mariners on Wednesday night, the Anglers will have an off day Thursday before making its third trip of the summer to Red Wilson Field to play Y-D at 5 p.m. on Friday. Broadcast coverage of the Anglers and Mariners on Wednesday begins at 6:40 p.m. with the Anglers Extra Pregame Show. Listen to Cooper Boardman and Josh Schaefer on TRZ Teamline or listen by phone at 1-800-846-4700, code 3841. For more information, visit Broadcast Central.